We love people who make sense and talk sense. 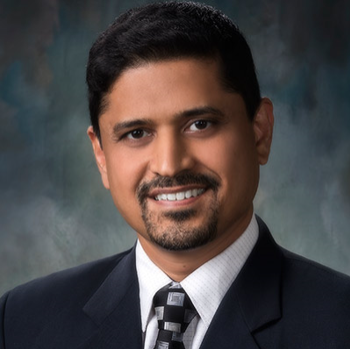 Here we have Mr. Samit Vartak, partner and Chief Investment Officer (CIO) of SageOne - a PMS offering company with 50% annualized returns from 2010. We feel below thoughts will definitely help our readers to understand some ground realities, when the floor is now crowded with ever bulls!!! Last 40 months have rewarded one in proportion to the risk he/she has taken and very few have lost money given the broad based nature of stock returns. Many fund managers have been claiming that they have beaten the indices and though it’s factually true, it hides one big parameter. “How much was the risk taken to get those returns”? In good times these facts are ignored by the investors and undue credit is taken by the fund manager. If we analyze valuation levels since the peak of previous economic cycle in 2008, the rise in multiples started from the last part of 2013. During 2009 to 2013, valuations were reasonable in most of the sectors. If you compare now, those multiples have moved upwards of 3x and many above 4x. The returns shown in above figure have been almost entirely because of PEx expansion and that is also inversely proportionate to the size of the companies. Worse is that the earnings growth has also been inversely proportionate to the returns. Simple average returns are stellar for small cap companies. If you had invested equally in the small cap companies beyond the top 500, you would have returned 356% (i.e. multiplied your investments by 4.56x), whereas if you had invested equally in the top 100 companies, the returns would have been only 73%. Where Are We on the Risk Graph Now? There are two key factors for stock values viz. earnings and PEx. Risk comes from either of the two contracting. Earnings contraction can occur due to topline de-growth or margin contraction. When margins reach peak levels during economic boom the risk of contraction increases from those elevated levels. Similarly PEx contraction risk increases the further it moves above the averages. 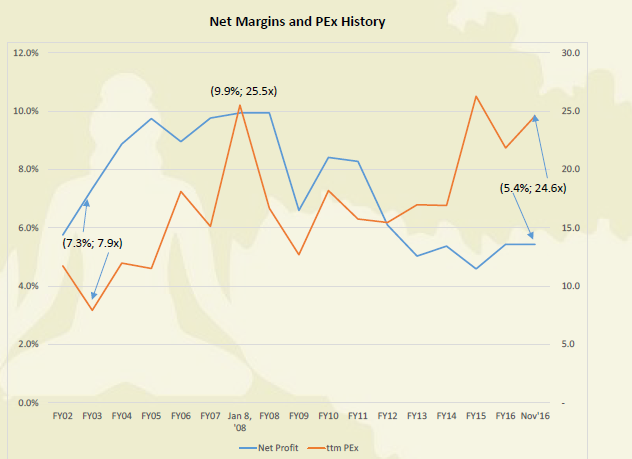 Case in point are two extreme instances, first in Jan ’08 when PEx as well as margins were at historical highs and second in Mar ’03 when both were at near historical lows. Accordingly risks were the highest in Jan’08 and lowest in Mar ’03. Currency replacement action has broken that momentum and has in fact increased the probability of margin contraction. Margins are vulnerable to increase in commodity prices (industrial metals, agriculture and energy) as well as operating deleverage from possible drop in capacity utilization. • Increased focus on tax compliance would mean tax avoiding informal sector (accounting for 75% of employment in India) to shrink resulting in widespread job losses before the economy evolves a new ecosystem. Only fraction of these jobs would be absorbed by the formal sector. • In a weak demand environment, commodity prices (20-100% increase over last year in industrial metals and rubber) have jumped and in this environment the ability of companies to pass on the cost increase is limited. Low commodity prices had helped companies improve gross margins in the recent few quarters. There is risk of this benefit reversing. • In an evolving environment, companies would postpone their investment plans thereby slowing job growth. Capacity utilization has been near historical lows at around 70% and this had impacted investment cycle even before the recent disruption. Reduced money supply generally has negative multiplier effect on the growth. • Government seems to be serious in dealing with tax evaders and cash hoarders. Assets such as properties and gold were the hiding places for such wealth. With many having to pay significant taxes on hoarded cash and at the same time physical assets like properties loosing value, wealth of many would be destructed. This along with many having to face tax scrutiny may have negative wealth effect thereby impacting spending for some time. • GST rollout is also potentially disruptive in the initial phase. There will be de-stocking of the channel in many sectors where taxes are expected to drop. This will happen just before the implementation of GST and it may take time for many smaller companies to be ready with the backend needed to handle the new tax system, thereby delaying growth. 1. With Government’s intention to reform the cash economy, the hope is that land/property prices would come down significantly. Above two are the biggest reforms in India’s modern history and have the potential to make India extremely competitive in the global manufacturing chain and help create global scale businesses. With transfer of wealth from informal to formal economy, government tax collections would significantly improve and if they allocate that capital efficiently (subsidy, infrastructure spend) India could transition into a much higher growth trajectory. Formal and transparent business practices would incentivize foreign investments and boost capital expenditure thereby employment growth. Valuations in the non-large cap stocks are discounting a lot of hope. I believe that the uncertainties have increased over the past two months and resultantly the re-start of growth phase for corporates is pushed out. In such environment, there is risk of not only multiples but also earnings contracting. It is time to be extremely careful in picking the right businesses and absolutely not the time to overpay. We have to be open to the possibility that sometimes what’s good for the country and overall population may not necessarily be rewarding for the stock market. Historically we have seen best of market returns under worst of governments and vice versa.